The very features characterising the Municipality of As Pontes make i tan excelentchoice for those who are considering where to invest or to set up their own business. Modern recently built communications infrastructure, ample energy resources and natural resources, well-trained and duly skilled labour continuing our Municipalty’s industrial tradition as well as institutional support for staring up new projects all mean As Pontes is a Galician industrial paradise. The excellent communications infrastructure naturally makes As Pontes the epicentre for anyone wishing to establish new companies and implement investment projects. The AG64 Motorway Ferrol-Villalba is the integrating axis connecting As Pontes with the different Ports in and around Ferrol (Outer and Inner) and with the North Castilian High Plateau. The A9 Motorway connects As Pontes with Coruña International and Domestic Airport as well as with the complete Galician Atlantic coast all the way into Portugal. The ports in Ferrol, no more than 15 minutes from As Pontes facilitate cargo shipping and goods traffic to and from different parts of the Iberian Peninsula, Europe and Asia. New shipping and transit lines are always in the making. Taking the A9 Motorway, Coruña and Santiago are only 40 minutes and an hour away from As Pontes, respectively. 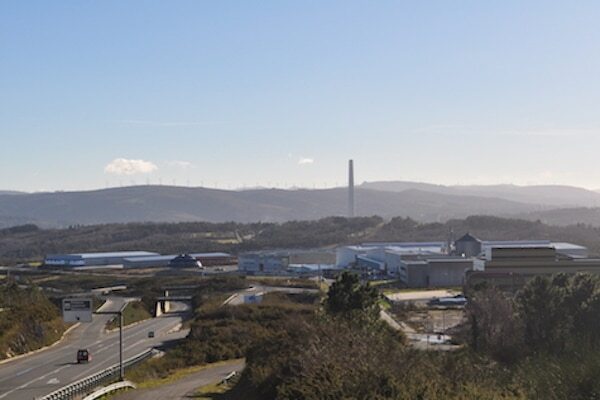 As Pontes is one of the highest ranking Galician Municipalties in terms of area dedicated to and available for industrial use and activities. Having said that, creating and developing new industrial areas is one of the Town Council’s key objectives. As Pontes maintains itself as an attractive industrial destination, not only becuase the land available, but likewise thanks to the quality of such land as it offers excellent communications infrastructure as well as ample energy, technology and natural resources. The population in As Pontes is chiefly made up of young people. The town’s long and strong industrial tradition has endowed it with skilled workers and staff, and there is a constantly ongoing effort to train and update their knowledge and skills. ENDESA Electricity Plant with an installed capacity of 2500 MW. Numerous wind farms all around the Municipality. 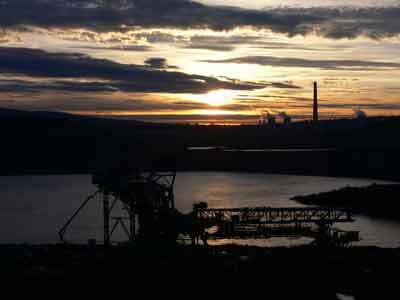 Lago de As Pontes Lake, the old carbón strip mine which has been turned into an 18 km-perimetre (11.25 miles) and 200-metre (220 yards) deep lake. Pantano da Ribeira Dam with a Water Energy Plant Hidroeléctrica. Pantano do Eume Dam with its own Water Energy Plant too. On the other hand, there is a noteworthy diversified industrial network sporting a sizeable number of auxiliary companies and suppliers supporting present and future industries. The IPPEC is presented on the 20th of February 2009 in the capacity of an entity bringing together a series of actions designed to promote and further the industrial and economic development of As Pontes. 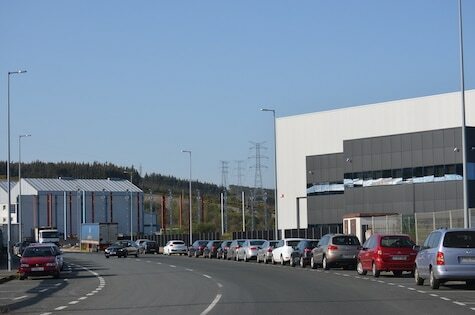 This Institute depends directly on As Pontes Town Council and is backed by the regional Xunta de Galicia government as well as by the Galician Institute for Economic Promotion (IGAPE) and is thereby given an official intersector nature where the different industries creating jobs are brought together. The IPPEC is managed by a team of professionals and technicians providing individual advice for each and every investment project. It works like a one-stop business and industrial service where all the investment projects to be carried out and implemented in As Pontes are submitted, so that tasks ranging from applications for industrial land to advice on how to find aids and funding for such projects are par for the course for our skilled and specialised staff. The IPPEC staff is at your disposal to offer advice on your possibilities to be eligible for public aids and funding to co-finance your investment Project. Identify all existing aids aimed at helping to fund your investment budget. Establish an optimal timetable to gain access to these aids in the most useful and fruitful way for your project to be successful. The IPPEC, in its capacity as an employment-promoting and job-creating tool, acts as a communication bridge between those promoting a given Project and the Public Bodies and Agencies granting aids and funding to this sort of industrial projects. The aim of this essential role is to generate an environment of institutional and political support towards projects deciding to make As Pontes their priority location for their industrial investments. 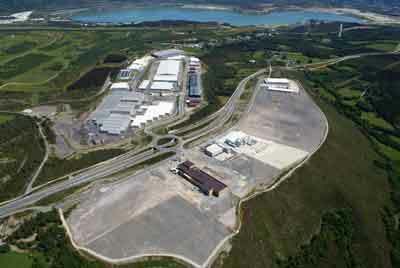 Penapurreira Industrial Estate is no less than 822.267 m2, which makes is the biggest industrial estate in As Pontes. This Industrial Estate was established as part of the “Plan de Desenvolvemento Económico-Industrial para As Pontes” (Economic and Industrial Development Plan for As Pontes) and was financed by ENDESA, A Xunta de Galicia, and Instituto para a Reestruturación da Minería do Carbón e o Desenvolvemento Alternativo das Comarcas Mineiras, (the Institue for Restructuring of Coal Mining and Alternative Development for Mining Areas). This entity took action to promote XESTUR-Coruña urbanisation and fitting-out works. The urbanisation project undertaken by the “Partial Plan for Penapurreira Industrial Estate” was carried out in different phases depending on the economic means available and the real needs for industrial land. 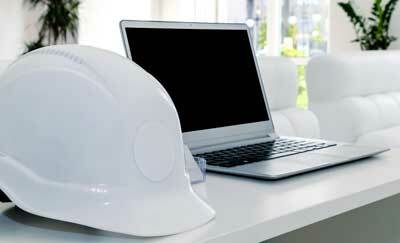 In this Estate, mainly medium-sized and large companies have established themselves. As far as different sectors are concerned, there is a considerable variety: metal processing, food, pellet manufacturing, distributors of agricultural and cattle products, photovoltaic encapsulants manufacturing, wood processing, printing and technology… All these sectors vouch for diversity and a more promising future for our Municipality. * 20 km to Ferrol Outer Port. * 60 km to Coruña Airport. Dos Airios is an industrial estate located no more than one kilometre from the town centre of As Pontes. It was created by the As Pontes Town Council in the early 80s due to the growing demand for industrial land. In those days there were many companies establishing themselves in areas and plots of land which were not, in fact, for industrial or commercial purposes. Building this new industrial estate was a way to try to solve that increasingly challenging situation. The oldest part of the industrial estate is 232.508 m2, of which c33.607 m2 are made up of streets and roads, and the actual industrial premises amount to some 198.901 m2. Dos Airios industrial estate is divided into 67 plots, of which 63 are occupied, two of them are owned by the Town Council and the other two are being excavated by archaeologists. The business people who established themselves in this industrial estate were given the right to use the plots for 75 years. The main feature of these companies is that most of them are SMEs, as the size of the plots ranges between 900 m2 and 5000 m2, although most of the plots are roughly 1000 m2. The plots were allotted by the Council by means of a draw in 2006. After extending it, the Dos Airios industrial estate now has a total area of 229.700 m2, of which the industrial premises, as such, occupy 139.795 m2. The size of the plots go from 16.336 m2, the largest one, to 3.170,7 m2, the smallest one. 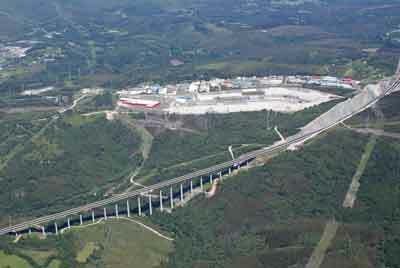 The business activity in As Pontes is by no means limited to its industrial estates. The leap in economic activity in our municipality gave rise to the need to set up two new areas: Cruz das Cabezas and A Balsa, with a different town planning and urbanism status, so called INDUSTRIAL SETTLEMENTS. They successfully contribute towards creating jobs, wealth, welfare and industrial diversity in As Pontes. The bigger of the two, A Balsa, adds as many as 600.000 m2 worth of industrial land, made available chiefly to large industries. Cruz das Cabezas has an area of 122.000 m2.